JRPG game created on the occasion of the fifteenth anniversary of the creation of the popular anime under the same title. We move into the digital world and, together with companions known from the series, we try to protect it from the mighty enemy. 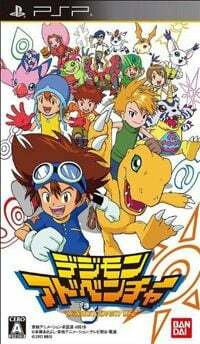 Digimon Adventure is another production based on a well-known anime series about children who have entered the virtual land and found companions in the form of the title creatures. The game was created to celebrate the fifteenth anniversary of the premiere of the television original and shows anew the events known to all fans, but also expands some threads. The mechanics of the game does not differ from other jRPG productions to a greater extent - we talk to the characters we meet, fight in turn-based clashes and develop the skills of our charges. In the course of the game, apart from the main plot, we also spend time on performing side tasks commissioned by encountered NPCs. The most important element of the game is Digimon's fight. As soon as we meet our enemies, we move to a separate board. The clashes take place in turn-based system. Each creature has special skills. Their statistics improve as they advance to the next level of experience, as well as by gaining more and more equipment. After completing the main thread we get access to the bonus scenario taking place in dangerous underground. Digimon Adventure has a cartoon graphic design created with the use of target-shading technology. The voice of the characters was lent to the same actors as in the case of the original.